Ultra offers four menu locations. Two conventional and two social icon menu locations. 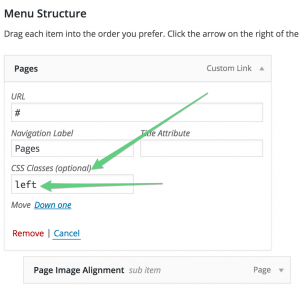 The below documentation assumes a basic understanding of the WordPress menu system. If you’re unsure how to create a custom menu and save it to a theme menu location, please see our menu basics tutorial. Ultra’s top bar menu appears in the top bar, above the header, on the right side. It supports unlimited drop down menus. To assign a menu to this location, go to AppearanceMenusManage Locations. Positioned to the right of the logo is the main menu. It also supports unlimited drop down menus. Ultra main menu, positioned to the right of the logo. The main menu search can be de-activated from AppearanceTheme SettingsNavigationMenu Search. Go to AppearanceMenus and click Screen Options top right. Under “Show advanced menu properties” enable “CSS classes”. Enable CSS Classes within [highlight]Appearance > Menus Screen Options[/highlight]. Locate a drop down parent menu item and click the down arrow next to the menu item name. Enter “left” as the class name. New direction of drop down menu after adding left class. Both the Top Bar Menu and Main Menu will accept a class of left to change the drop down menu direction. Ultra’s social icon menus make it easy to add your social network icons via Appearance > Menus. For a full run through of how to do this and what networks are supported, please see our main social icon menu documentation page. The top bar social menu appears on the left of the top bar, to the right of the phone and email text. Top bar social icon menu. 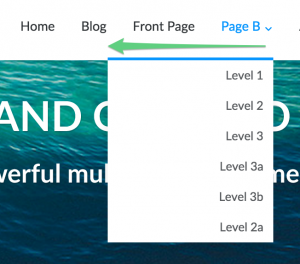 The bottom bar social menu appears on the right of the bottom bar, below the footer widget area. As of Ultra x.0.1 you can add social icons to any menu location. You can also add regular menu icons to the social menu locations. See our social icons documentation page for a full run through on adding social icons to any of your Ultra menu locations.